Punishing rain fell from a wounded sky. Thunder roared above, as gunfire and the revving of engines echoed across the battlefield below. A spear of crimson-hulled vehicles belching black smoke smashed through the tree line toward the enemy. Leading the advance was a line of Vindicator Siege Tanks, their massive dozer blades crushing everything in an unstoppable wall of adamantium. Following close behind were a dozen Rhino armored personnel carriers, their Lucifer-Pattern engines howling in overdrive. Within the lead Rhino, Sergeant Nerva grinned, the red internal lighting glinting off his elongated canines. Three years of slogging through the mud, rain, and mountains of 13-501. Three years of chasing down the bipedal, canid-like xenos that infested the region and burning them out of their brood-lairs. The campaign had been long and hard-fought by the standards of the Legiones Astartes, but truth be told, the brothers of the 18th Company had enjoyed the challenge. The canid-xenos were cunning and possessed weapons of significant technological advancement. They slaughtered the Solar Auxilia forces sent in to pacify the planet and ignored all attempts at communication. Thus it fell to the warriors of the IX Legion to bring 13-501 into compliance. This was the kind of fight the 18th Company excelled at, dynamic mechanized warfare. “Smash and burn” was the unofficial catch phrase used amongst the battle-brothers. Searing phase-laser fire lanced the side armor of their Rhino, but failed to penetrate. Nerva slammed his fist against the hull and laughed, “Try again!” A series of vox-distorted chuckles sounded from the members of 1st squad in reply. The driver abruptly changed course, angling their vehicle into the teeth of the oncoming enemy fire. Around them, the rest of the formation seamlessly mirrored the movement, meeting the fusillade head-on. As one, the Vindicators opened fire with their hull-mounted demolisher cannons, drowning out the sky’s thunder with their own. A series of deafening explosions tore the enemy line apart, overloading their arc-shields in a microsecond with sheer kinetic force. The canid-xenos were torn asunder, bodies blasted into oblivion or flung hundreds of meters to land in ragged piles of flesh and broken cybernetics. The squadron of legion vehicles smashed through the smoking remnants of the xenos line, their hull-mounted heavy bolters exterminating any survivors with precise volleys of mass-reactive rounds. Beyond the destroyed enemy position, the terrain rose sharply toward a series of jagged peaks. The sonorous voice of Centurion Kyros cut across the detachment’s general vox band, “All units advance and engage. Stand by for tactical inload.” Sergeant Nerva donned his crested helm and activated the neck seals in his armor. Its internal display painted everything in a pale emerald green. A series of miniature icons representing the status of his armor, weapons, and the vitals of 1st squad hovered near the edge of his vision. An additional blinking icon in the shape of a skull indicated the Commander’s deployment orders. With a thought pulse, Nerva opened the inload and was presented with a geometric overlay showing the location of a xenos brood-lair. The genetically enhanced structure of his brain instantly memorized the information and he clicked a confirmation icon with another pulse of thought. The unit leaders among the rest of the formation acknowledged as well, directing their vehicles up the incline with a roar of engines and thundering treads. The canid-xenos utilized cloaking technology, detectable only by infrared imaging, to shield their lairs. The warriors of the Legiones Astartes, however, had no difficulty locating and destroying the xenos strongpoints thanks to the technological enhancements of their power armor. As they approached the designated target point, the Vindicators cut loose with another salvo. The devastating barrage shattered the cloaking shield and blasted open several of the underground entrances. Coming to an abrupt halt, the legionnaires deployed, bellowing war cries and battle oaths. Sergeant Nerva was the first to disembark “Advance! Exterminate them!” 1st squad roared in assent and charged in, combat blades gleaming in the rain. Nerva joined the assault with a grin, bolts of corposant arcing from his charged powerfist. This was what they lived for, what they were known for, what they excelled at. They were the Blood Angels, and none could withstand their fury. Edited by Brother Tyler, 28 February 2016 - 05:02 AM. 867.M30 – 131st Expeditionary Fleet – Compliance: 131-16 "Katharka Secondus"
Techmodari Blain glanced sideways as he flipped on his secondary monitor station. The station’s warm-up hum was eclipsed by the crackling void shield far above. The black screen in front of the tech savant reflected his grinning face. Even this far below the surface, the sounds of the invaders' impotent artillery barrage was audible. “Keep trying you worthless bastards,” his words echoed about the vast underground chambers of the fortress’s reservoir complex. The six combat tasked servitors flanking Blain’s workstations made no reply other than the occasional clatter of an autoloader. Blain’s smirk disappeared as he skimmed the newest figures displayed in front of him. The influx scrubbers were still registering an unacceptable amount of metallic sediment in the outflow passages just as they had for the past several hours. The screen continued to scroll with unattractive numbers as his eyes traced them back and forth. He sat back with an exasperated sigh. It was probably another crush point; the enemy's seismic munitions had been playing hell with the geological stability of the region in recent days. If it didn't clear out soon, he’d have to task another servitor team into the chem-chilled waterways. Unfortunately, the servitor teams never came back undamaged from the massive spill way pipes, if they came back at all. The Techmodari jumped as all six servitors cycled to hunting-active near simultaneously. They stalked forward in aggressive lunges, their rotary cannons swinging into position as they scanned the interior of the reservoir facility. Prerecorded compliance phrases blared from their implanted vox speakers. The left most servitor detonated spectacularly as a mass reactive pierced its armorplas breastplate and blew the remains of its organics out of its torso in a four meter spray behind it. The second died identically a split second later. The last four were hit from several angles at once, each ceasing to be in impressive gouts of entrails and sacred oils. From the poorly lit depths of the facility hulking, black-armored figures strode from the darkness. They fanned out across the floor, weapons up and searching every angle of the complex. Blain rolled backwards out of his chair and clamored under his desk. The armored giants were massive, bigger than the genebulked servitors, but with none of their mind-wiped awkwardness. Did these massive soldiers belong to the invaders? Blain had only seen the unaugmented battalions that had been attempting to breach his Tech Coven’s fortress for the past week. One of the giants stopped in front of the workstation. Water ran in rivulets from its black, multilayered ceramite plate. Upon one shoulder, a black clad fist glared from a field of pure white. The techmodari’s gaze traveled up past the massive caliber weapon leveled at him to the impassive dark helm. The red eye lenses reflected Blain’s terrified face. "What... are you?" the tech savant stammered brokenly. "We are the sons of a most vengeful father," Kona Sahn-hi responded. The boltgun clutched in his fist roared. Edited by Flint13, 21 February 2015 - 07:55 PM. Very nice start, look forward to seeing more from you both. A phrase we shall carry with us for the rest of time. Just posting so that this will show up when I search for new content. Said it in your PloG but: IMPERIAL FISTS!?!? WOOO AND BLOOD ANGELS TOO!?!?!? Flint are these gonna be templars? Or just fists? ....Aaaaand subscribed. Looking forward to seeing where this goes. This is gonna be so boss! 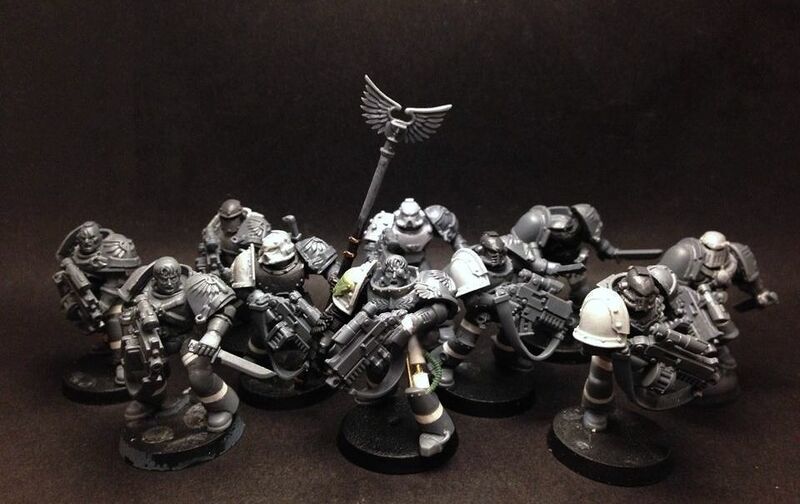 wait wait wait, flint13 doing Fists.......brother heinrich doing blood angels???? Two of my favourite hobbyists combining to bring us a mega dose of HH goodness, life doesn't get much better! Super excited for this thread. I was going to say that, fortė. Great start so far, you two. 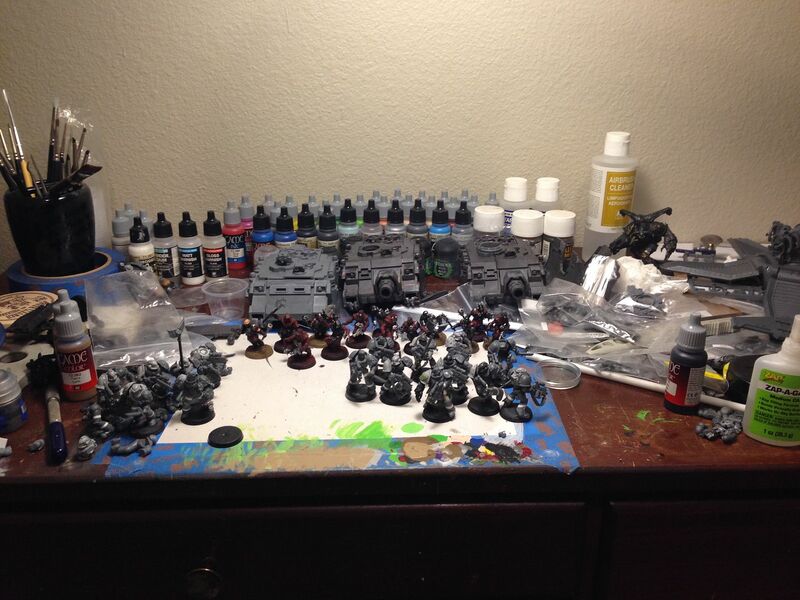 I'd looove to see those two legions in your impressive paint styles. Flint AND Heinrich, doing HH together?? Im definetly going to keep my eye on this. Edited by GrandMagnus, 21 February 2015 - 04:32 PM. Ooh, tall Blood Angels. Consider me interested. Welp, there goes my notifications every day. Angels are looking lovely, Templars are looking lovely. Everything is looking lovely. Lovely. Flint... is doing Templars.... oh god I can just picture the grit and gore platters... bring on the ZEAL! Well now, this is unexpected. I'll be very interested in seeing where this goes. This is going to be inspiring, that's for sure! Thank you everyone for the all the initial interest. This collaborative project between Flint and myself has been in the works for about 2 months now so don't worry, we've got plenty of good material to keep you all well sated on models and fluff. I can't tell you how much it means to both of us to have this amount of support from the community right from the get go. More will obviously be revealed as time goes on but rest assured, we will be covering a lot of ground (all of it blood-soaked and brutal). While not a fan of the true scaling stuff, I am a fan of awesome models and fluff and can't wait to see how you two tackle loyalist Legions. I'm also going to warn the both of you, I better not see this project sputter and die after a couple of weeks, damn it. Hmmmmm I want to be psyched but I need paint to be more enthusiastic and some close ups. Of course you guys got support from the community! Most of is/was/at one time Night Lords!